If the population of the city center (or “city proper” in the literature) is considered (i.e. the population of all the urban districts (Shiqu) for province and prefecture level cities, and those of the district for the district level cities), thus the population of the largest cities can be underestimated insofar as the cities dense urban built up area often extends beyond the boundaries delimited by the urban districts. Conversely, the population of the small district level cities could be over-estimated, the administrative limits of the districts being larger than the boundaries of the district level city. In India, two types of cities coexist: the Statutory towns and the Census towns. The Statutory towns are cities designated through political arbitrations based on rules and thresholds that differ from State to State. As the State government’s decisions, local requests and political games and relations between local and regional powers strongly influence the designation of Urban Local body, an important interstate variability is observed regarding the urban classification. It particularly impact the smallest entities, in transition from rural to urban, but also to expand the large urban areas, either through their recognition as urban local bodies belonging to census defined Urban Agglomeration or through their inclusion partly or totally as Urban Outgrowth of existing Statutory or Census towns (Sivaramakrishnan et al., 2007; Ramachandran, 2011; Denis et al., 2012; Pradhan, 2012). The recognition of Census Towns is based on statistical specifications (a threshold of population of at least 5,000 inhabitants, a minimum density of population of 400 inhab. per km2 and at least 75% of the male population engaged in non agricultural activities). These designation criteria are based on the data collected during the previous census, which was held ten years prior to their designation (Denis et al., 2011; Chandramouli, 2013). This led to a decadal underestimation of small towns. The sources of national censuses are often insufficient for studying the urban phenomenon. This difficulty is first in the political nature of the appointment of cities and their administrative boundaries, which is often inappropriate to capture the spatial evolution of the urbanization process. Moreover, it does not allowed measuring the evolution of the cities over long period of time, and comparing the size and the evolution of the cities defined according to the same referent. Specifically for China, “ the lack of well-defined and standardized terms for urban settlements in China has created much confusion among Chinese as well as Western scholars regarding the size of China’s Urban Population and the nation’s urbanization level ” (Ma et MaCui, 1987). On the other hand, it is necessary to harmonize the definitions of the city as independently as possible of their administrative boundaries in order to enable international comparisons. So it is necessary to harmonize the definitions of the city as independently as possible of their administrative boundaries in order to enable international comparisons. We have thus constructed two database, one for China called ChinaCities (Swerts, 2013) and one for India called Indiapolis, based on a definition of cities that are morphological agglomerations larger than 10,000 inhabitants (Moriconi-Ebrard, 1993). In a first step, the continuous urban built area separated by less than 200 meters was delineated using Google Earth images from the year 2000 with a resolution of 7,000 feet (~ 2,134 m). This perimeter was georeferenced and integrated in a Geographic Information System (GIS) and adjusted to entire districts where urban zone was dominant, whatever their urban/rural type (Qu/urban districts, Xian/rural district and Xianjishi/district level cities). In a fourth step, when districts were too large to be contained in agglomeration, the smaller town’s level units (Zhen/towns and Xiang/township) were used to delineate the built-up area perimeter. The data of Zhen were available for 2000 and 2010 but not for previous periods. As a consequence, the urban areas are defined with more precision in 2000 and 2010 and they are more numerous (ChinaCities), but to permit the comparison with previous year, another database was built adapted at the level of districts (ChinaCities adapted to districts) (Tab.1). Because some rural areas can be very dense, both in terms of population and urban built up, the number of towns could be overestimated, some “morphological agglomerations” including overwhelmingly workforce engaged in primary sector’s activities (agriculture, forestry, fishing). To bring a correction, an economic criterion has been added that refines the urban character of these observed morphological settlements. It allows excluding all agricultural morphological districts agglomerations from the database. This was possible by the integration of the demographic and economic data from official census of 1964, 1980, 1990, 2000 and 2010 of districts and associated to the continuous urban built area perimeters. These databases will be published soon. Bretagnolle, A., Delisle, F., Mathian, H., & Vatin, G. (2015). Urbanization of the United States over two centuries: an approach based on a long-term database (1790–2010). International Journal of Geographical Information Science, 29(5), 850-867. Chan, K. W., & Xu, X. (1985). Urban population growth and urbanization in China since 1949: reconstructing a baseline. The China Quarterly, 104, 583-613. Chan, K. W. (2010). Fundamentals of China’s urbanization and policy. China Review, 63-93. Cottineau, C. (2014). L’évolution des villes dans l’espace post-soviétique. Observation et modélisations. PhD dissertation, University Paris 1 Panthéon-Sorbonne, dir. D. Pumain. Guerois, M., Bretagnolle, A., Giraud, T., & Mathian, H. (2009, September). From Urban Morphological Zones (UMZ) to harmonised «urban objects» in Europe. In European Colloquium in Theoretical and Quantitative Geography (ECTQG). Ignazzi, C.A. (2015). Coévolution dans le système de villes Brésilien. PhD dissertation, University Paris 1 Panthéon-Sorbonne, dir. D. Pumain. Ma L.J. C. & Ma C.G. (1987). 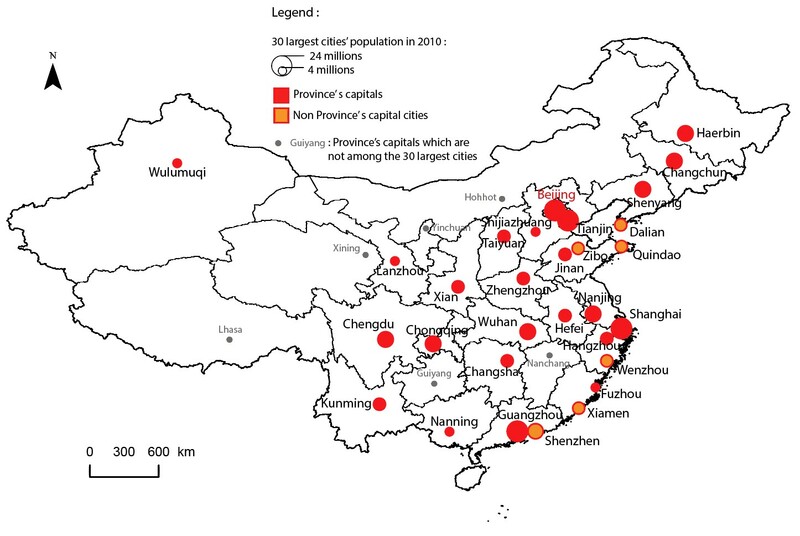 Administrative changes and urban population in China. Annals of the Association of American Geographers 77(3): pp 373-395. Ma, L. J.C. (2005). Urban administrative restructuring, changing scale relations and local economic development in China. Political Geography, 24(4), 477-497. McGee, T. G. (1991). The emergence of desakota regions in Asia: expanding a hypothesis. The extended metropolis: Settlement transition in Asia, 3-25. Moriconi-Ebrard, F. (1993). L’Urbanisation du Monde depuis 1950. Paris, Editions Anthropos, collection Villes, 1993, 372 p.
Pradhan, K. C. (2012). Unacknowledged Urbanisation : The new census towns of India. New Delhi, Centre for Policy Research: 24. Rozenblat, C. (1992). Le réseau des entreprises multinationales dans le réseau des villes européennes (Doctoral dissertation, Paris 1). Swerts E. (2013). 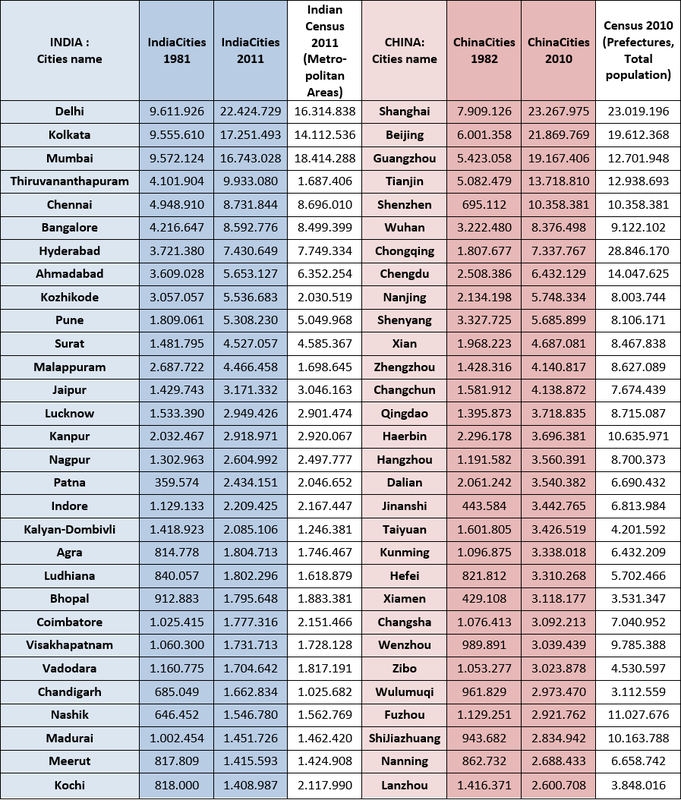 Les systèmes de villes en Inde et en Chine. PhD dissertation, University Paris 1 Panthéon-Sorbonne, dir. D. Pumain. This entry was posted in Project 3, Results and tagged BRICS, China, Developing countries, India, Urban systems by Olivier Finance. Bookmark the permalink.